Fox Valley Dental Orthodontic Treatment - Braces, Invisalign, or Both? Invisalign is a system of clear aligners that are an alternative to wearing the traditional Orthodontic treatment – braces. They tend to be comfortable, more discrete, and convenient in that you remove them to eat, to brush and floss your teeth, and for dental visits. With those advantages, why do traditional braces still exist? Great question! The answer lies in the fact that braces are attached to teeth and thus they are capable of controlling certain movements that can’t always be accomplished with clear aligners. 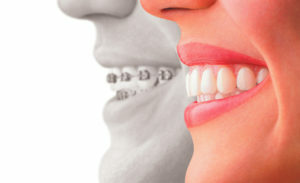 Braces are also better for patients who can’t or won’t reliably wear clear aligners. Braces vs aligners–how do you know? As an orthodontist experienced in Orthodontic treatment with both Invisalign and braces, Dr. Olsen will evaluate your bite needs during the initial orthodontic evaluation visit. He will then discuss the pros and cons of both options with you. What if braces would work better but you still want clear Invisalign? The good news is that we can generally offer combination treatment in these situations. Typically this means starting with traditional braces and then switching to Invisalign when appropriate. Why should I use Invisalign vs. an at-home clear aligner system? With Invisalign, Dr. Olsen takes a hands-on approach, making adjustments to your treatment plan as needed. In addition, he has the ability to bond attachments to some of your teeth if needed. This ensures the teeth move as they should. At-home systems can’t do that. Why Dr. Olsen and Fox Valley Dental for Orthodontic Treatment? Because we are experienced in both Invisalign, braces, and combination treatment, we are free to recommend the option that is best for you. Invisalign is often viewed as an off-the-shelf solution, but in reality clear aligners are one of several tools by which orthodontic treatment is performed. To achieve proper orthodontic results Invisalign requires the same judgment, skill, and planning that braces do. If you would like to find out if Invisalign or traditional braces are right for you, please contact us at 920-725-1327 to schedule an evaluation with Dr. Olsen.